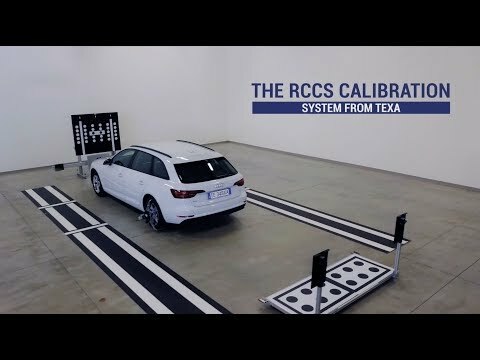 ADAS – Advanced Driver Assistance Systems - TEXA UK Ltd. Designed to provide safety and comfort while driving, the ADAS (Advanced Driver Assistance Systems) are ever more common in the latestgeneration vehicles and can include: autonomous emergency braking, cruise control, lane departure and pedestrian and traffic sign recognition, to name just a few. To help professionals repair these sophisticated active safety devices, TEXA has developed a complete, modular, multi-brand solution able to meet the diverse needs of automotive professionals, be they glass replacement specialists, body-shop technicians or multi-brand workshops. The RCCS is modular since it is compatible with all TEXA panels, with the possibility to choose only the required panels, based on the operator’s needs. While in the past, if the windscreen was damagedor broken, all you had to do was replace it, now it is necessary to restore the proper operation of the cameras dedicated to driver assistance. The CCS (Camera Calibration System) has been designed to create the best combination according to the technician’s operational needs. It is composed of a robust support on which the several panels divided by make are to be positioned. a solution that is extremely easy to use, handy and easy to carry, even for use outside of the workshop. The CCS is perfect for those who cannypermanently dedicate an area of their workshop to the calibration of cameras: in fact, once the operations on one or several vehicles is complete, all the equipment can be disassembled and easily stored away. The panels can be perfectly integrated with the RCCS and CCS. It is an essential device to calibrate the ultrasonic radars installed in vehicles such as HYUNDAI, HONDA, KIA, LEXUS, MAZDA, MITSUBISHI, SUBARU and, TOYOTA. It is composed of a metal reflector cone, a laser and a goniometer jig to help the operator position the pyramid cone correctly. The reflector developed by TEXA is flexible as it can be used for the front, side and rear radars. Some truck and commercial vehicle manufacturers require specific equipment for the proper calibration of driver assistance systems, which include cameras, radars and sensors that govern the Adaptive Cruise Control. TEXA offers an adjustment system that includes a measuring bar, panels divided by make – dedicated to cameras and laser devices – that are essential for the correct alignment and calibration of WABCO, TRW and TRW/Knorr radars. The ADAS TRUCK Kit also includes a set of clamps with laser pointer, a laser to adjust the Adaptive Cruise Control and the mirror adapter for WABCO radars. Furthermore, the IDC5 software guides the operator step by step in the case of vehicles that carry out the self-calibration through onroad adaptation procedures. TEXA’s solutions are to be used in combination with the IDC5 diagnostic software, which allows quick calibrations. In fact, the application provides specific diagnostic help sheets for each make/model, with the instructions for the correct positioning of the unit (such as panel height from the ground, distance from the vehicle, alignment, etc. ), guiding you step by step throughout the procedures. At the end of the calibration, you can also print a report to hand over to the customer, with the evidence of the operations carried out.